Do Decisionmakers Think About Damages to Innocent Children of Prisoners? HRANA News Agency – The transfer three weeks ago of political prisoners in Rajai Shahr prison in Karaj to a special security ward has initiated a series of protests by these prisoners which continues to this day, with 18 prisoners on hunger strike. 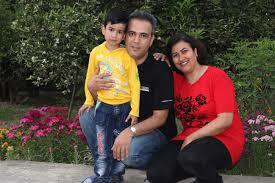 Azita Rafizadeh, a Baha’i prisoner in Evin Prison, whose husband Peyman Kouchakbaghi is imprisoned in this critically dire situation while the young child of this couple is outside, deprived of parents’ care, responded to these events by publishing a letter addressed to her young son, who has been deprived of visiting his father. According to HRANA, the Human Rights Activists News Agency in Iran, the political prisoners detained in Rajai Shahr prison of Karaj, who are estimated at 53, in recent weeks have been transferred to a new security ward. In this ward, where even health care facilities are equipped with CCTV cameras, unprecedented deprivations have been imposed on the prisoners. The resulting situation has prompted political prisoners to protest. At least 18 inmates in this ward are now in their twentieth day of a hunger strike under highly difficult circumstances. 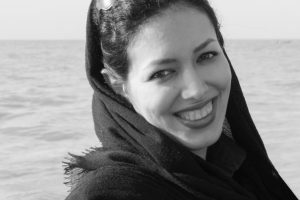 Azita Rafizadeh, a Baha’i detained in the women’s ward of Evin Prison, who was arrested along with her husband, Peyman Kouchakbaghi, and who was tried and imprisoned, wrote a letter to her young son Bashir. This imprisoned couple and their son were allowed inter-prison visits in accordance with the regulations of the Prisons Organization. These moments allowed the boy to have the opportunity to be together with both parents at the same time. Now that this opportunity has been taken away from Bashir, as stated in the narrative and open letter of this imprisoned mother, as reported by HRANA. Today, after two weeks, I was able to hug and kiss you in the visitation room, but this visit had a different feel. As if I wanted to compensate for the lack of kisses and embraces of your Daddy Peyman, or perhaps I wanted you to compensate for my not having seen Daddy Peyman for 23-days. At the same time as you were in my arms, I felt how Daddy must long to hold you in his arms, and surely you too really miss him, though you didn’t say a word. I remember about two months ago, using the excuse of not having an in person visitation letter, they offered you a visit with your dad behind glass, and you protested this event by standing behind the glass cabin, although you did not speak a word. This time, since you hadn’t had a face-to-face visit last week, you did not protest, but settled for the glass cabin visit. I know how important the few minutes of football with your dad in the narrow hallway of the visitation room was to you, how you counted the days for two weeks to have that chance, and how, as you mentioned, you couldn’t sleep the night before because of the excitement ‒ but there are people who easily deprive you of this right and need. I do not know if those in the decision-making authority, who make such decisions, ever think how their decisions harm the innocent children of the prisoners. Will they be able to answer for their deeds in the presence of God, in the next realm? Even those who are silent, claiming that it is out of their hands, in the face of these atrocities against the inmates and their children: can they sleep at night with a clear conscience, or embrace their own children? But my son, what we have learned is that we are to pray for all of these people, and we must ask God to awaken their consciences and open their eyes to the truth. This is the third week in which they did not bring Daddy in for our family visit. A time when the three of us can be together, even if only for two hours, and experience the pleasure of being in each other’s company. A time that you really enjoy, and you count on each minute of those two hours. I know that these days, after 5 months have passed since my first furlough, you were waiting for me to come back on another furlough. I remember many times you told me, “I would like to have Daddy come for a visit once too, and how great it would be for your visits to coincide, and both of you come for a furlough together”. Not only was this request not met, but they also deprived us of our two-hour visit of the three of us together. But, my dear boy, in this situation too we must be strong and hopeful that we can soon see Daddy again and hold him in our arms. Be together again, for a few hours, the three of us, so you two can play soccer again. You have to know that other than your Daddy there are many other Daddies who are in the same situation, who are deprived of seeing their children and holding them, and even worse, they are deprived of minimum necessary living conditions, such as water and healthy food and fresh air. Strong and brave men whose health is in danger, who don’t even have necessary medications. I ask you to say prayers for all of them every night, and ask God to improve their health and living conditions, and for their freedom. I too will join you in these nightly prayers. I have no doubt that God will hear our voices, and will fulfill the wishes of your little pure and innocent heart. I love you and hold you in my thoughts every moment. 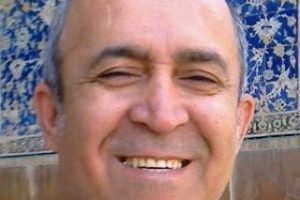 Azita Rafizadeh and Peyman Kouchakbaghi have both been sentenced, to 4 and 5 years of prison respectively, in the Evin and Rajai Shah prisons, on charges of membership in the illegal Baha’i Faith Administration, with the aim of acting against national security through illegal activity in the educational institution (BIHE). Today, Atena Daemi, Golrokh Irayi and Maryam Akbari Monfared, three civil activists in Evin Prison, wrote a letter calling for attention to the dire situation of prisoners of conscience in Rajai Shahr prison in Karaj.